She appeared in over 60 films, winning the Academy Award for Best Supporting Actress for her role in Key Largo, and earning nominations for her roles in The High and the Mighty and Dead End. She also received top-billing in Stagecoach. Trevor was born in the Bensonhurst area of Brooklyn, New York, the only child of Noel Wemlinger, a Fifth Avenue merchant tailor, and his wife, Benjamina ("Betty"). She grew up in Larchmont, New York. For many years, her year of birth was misreported as 1909, a rare instance of an actress actually being younger than her given age, which is why her age at death was initially given as 91 and not 90. She was of German, Irish and French descent. According to her biography on the website of Claire Trevor School of the Arts, "Trevor's acting career spanned more than seven decades and included successes in stage, radio, television and film. . . . [S]he often played the hard-boiled blonde, and every conceivable type of 'bad girl' role." After completing high school, Trevor began her career with six months of art classes at Columbia University and six months at the American Academy of Dramatic Arts, performing in stock in the late 1920s . By 1932 she was starring on Broadway; that same year she began appearing in Brooklyn-filmed Vitaphone shorts. Her first credited film role was in the 1933 film Life in the Raw, with her feature film debut coming that same year in Jimmy and Sally (1933) as "Sally Johnson". From 1933–38, Trevor starred in 29 films, often having either the lead role or the role of heroine. In 1937, she was the second lead actress (after top-billed Sylvia Sydney) in Dead End, playing opposite Humphrey Bogart, which led to her nomination for Best Supporting Actress. From 1937–40, she appeared with Edward G. Robinson in the popular radio series Big Town, while continuing to make movies. In the early 1940s, she also was a regular on The Old Gold Don Ameche Show on the NBC Red radio network, starring with Ameche in presentations of plays by Mark Hellinger. By 1939, she was well established as a solid "leading lady". Some of her most memorable performances during this period were opposite John Wayne, including the classic 1939 western Stagecoach, which was Wayne's breakthrough role. She starred opposite Wayne again in Allegheny Uprising that same year, and yet again in 1940 in Dark Command. Over a decade later, she would again costar with Wayne, gaining her final Oscar nomination for The High and the Mighty. In 1957 she won an Emmy for her role in the Producers' Showcase episode entitled Dodsworth. Trevor moved into supporting roles in the 1950s, with her appearances becoming increasingly rare after the mid-1960s. She returned for one final theatrical film, as Charlotte in Kiss Me Goodbye (1982). Her last film was the 1987 television movie Norman Rockwell's Breaking Home Ties. Trevor made a guest appearance at the 70th Academy Awards in 1998. Trevor married Clark Andrews, director of her radio show, in 1938, but they divorced four years later. Her second marriage, in 1943, to Navy lieutenant Cylos William Dunsmore, produced her only child, son Charles. The marriage ended in divorce in 1947. The next year, Trevor married Milton Bren, a film producer with two sons from a previous marriage, and moved to Newport Beach, California. In 1978, Trevor's son Charles died in the crash of PSA Flight 182, followed by the death of her husband Milton from a brain tumor in 1979. Devastated by these losses, she returned to Manhattan for some years, living in a Fifth Avenue apartment and taking a few acting roles amid a busy social life. She eventually returned to California, where she remained for the rest of her life, becoming a generous supporter of the arts. Trevor died of respiratory failure in Newport Beach, California on April 8, 2000 at the age of 90. She was survived by her two stepsons and extended family. For her contribution to the motion picture industry, she has a star on the Hollywood Walk of Fame at 6933 Hollywood Blvd. On March 8, 2016, Turner Classic Movies honored Trevor on the 106th anniversary of her birth by showing several of her films. ↑ Drew, William M. (1999). At the Center of the Frame: Leading Ladies of the Twenties and Thirties. Vestal Press. p. 319. ISBN 1-879511-42-8. ↑ Hagen, Ray; Laura Wagner (2004). Killer Tomatoes: Fifteen Tough Film Dames. McFarland. p. 222. ISBN 0-7864-1883-4. ↑ Clara Wenlinger [sic], daughter of Noel and Benjamina, age 2 mos, is in the April 1910 Census of Brooklyn Ward 30, District 1054. This places her birth unambiguously in 1910. ↑ "Oscar Winner Claire Trevor Dies". highbeam.com. 2000-04-08. Retrieved 2009-02-20. 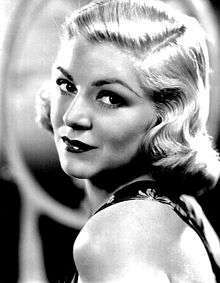 ↑ "Claire Trevor profile at FilmReference.com". filmreference.com. Retrieved 2009-02-20. 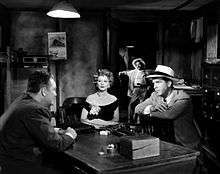 1 2 3 "Claire Trevor, 91, Versatile Actress, Dies". New York Times. 2000-04-10. Retrieved 2009-02-20. ↑ "Friday's Highlights" (PDF). Radio and Television Mirror. 14 (3): 52. July 1940. Retrieved 6 March 2015. ↑ The Complete Directory to Prime Network and Cable TV Shows, 1946-Present. Ballantine Books. 2003. p. 1413. ISBN 0-345-45542-8. ↑ "'Digest' Star". Harrisburg Telegraph. October 26, 1946. p. 21. Retrieved September 29, 2015 – via Newspapers.com. Wikimedia Commons has media related to Claire Trevor. Guide to the Claire Trevor Memorabilia. Special Collections and Archives, The UC Irvine Libraries, Irvine, California.